Today is bittersweet for all of us at Lone Star Credit Union. Jerry Clancy, LSCU President and Chief Executive Officer, has announced his retirement effective September 30, 2018. Mr. Clancy has been an integral part of LSCU for the last 49 years and served as President for more than 25 years. He will remain on the LSCU Board of Directors through his elected term (2020). Although he is leaving our credit union family, we are excited for Mr. Clancy to be able to spend more time with his wife, children, and grandchildren. Creating a family bond between the employees at LSCU has always been a core part of Mr. Clancy’s legacy, and his leadership will be greatly missed. Our Board of Directors has been working to find our new Chief Executive Officer and we will announce their decision in the next few weeks. Until then, we’d like to congratulate Mr. Clancy and celebrate his legacy at Lone Star Credit Union. 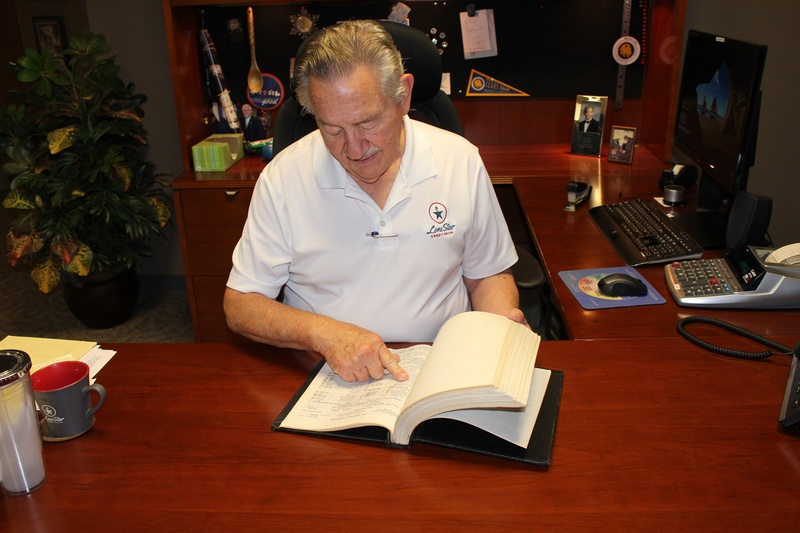 Mr. Clancy’s story with Lone Star Credit Union began in September of 1969, when he was transferred from the gas supply department of Lone Star Gas Company as Collector for delinquent accounts. He was one of four total employees and the credit union was only open from 10:00-11:00 am and 1:00-3:00 pm Monday through Friday. Their office was located in the showcase room, which featured gas-powered appliances, on the 1st floor of the South Building in downtown Dallas. Small but mighty, Mr. Clancy saw the credit union reach 1 Million in assets by the end of June in 1970, faster than any other credit union in Texas at the time. Mr. Clancy was promoted to Executive Vice President in 1977 after the credit union became Enserch Federal Credit Union (following Enserch Corporation’s acquisition of Lone Star Gas Company). As Enserch Corp. continued to acquire several other companies including Ebasco, a nuclear power generation facility builder, the credit union’s field of membership expanded. Mr. Clancy remembers being so busy with new accounts, the credit union temporarily put a halt on lending operations. Over a nine month span, the credit union grew by $1.2 Million, totaling $9.9 Million in assets by the end of April 1979. 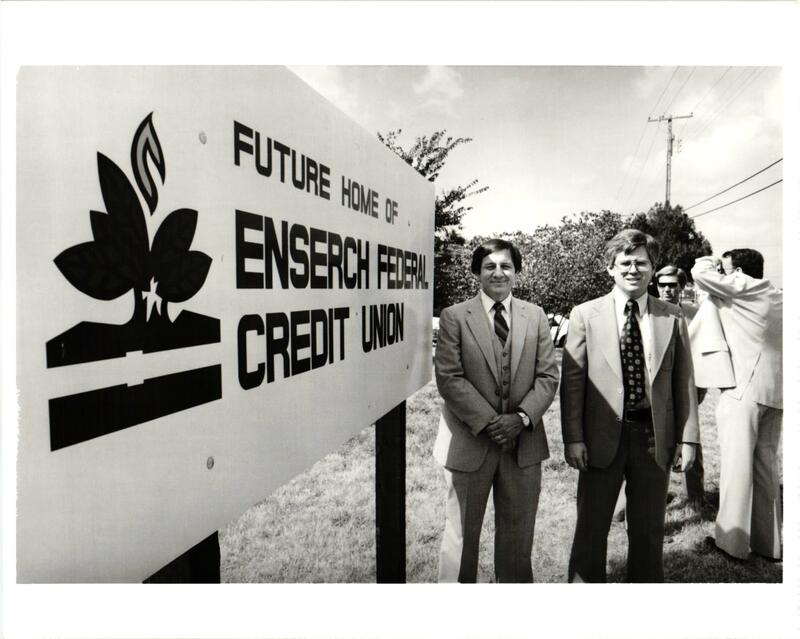 Jerry Clancy (left) at the ground-breaking ceremony for Enserch Federal Credit Union's headquarters in Dallas, TX. The fast-growing membership required the need for more financial services, so Mr. Clancy traveled to meet with the top executives of the various energy companies to identify what solutions the credit union could provide its new Members. His favorite trips were to the credit union office in New York City, located on the 86th floor of 2 World Trade Building. He enjoyed visiting with the employees and they always wanted to talk to him – he thinks mostly to hear his Texas drawl. His visits became so popular that the office manager asked Mr. Clancy to give him a heads up when he was coming. Mr. Clancy’s rise to leadership came from his ability to perform under pressure. In 1991, LSCU’s President was hospitalized and was unable to attend the board meeting. He recalls his boss being a very private man and Mr. Clancy had never attended a board meeting – now, he was asked to conduct one. Mr. Clancy’s leadership in that meeting was impressive, and when the Board of Directors started searching for a new President in 1992, they didn’t have to look far. January 1, 1993, Mr. Clancy took the reigns as Lone Star Credit Union’s President and CEO. After only a few years, the NYC office was closed when Raytheon purchased Ebasco from Enserch Corp. in 1995. Only 2 years later, TXU purchased the gas company from Enserch Corp. and chose to not keep the credit union within the company. Once again, Mr. Clancy’s leadership withstood the pressure. He applied for a state charter and eventually a community charter, which was granted in 2000. Mr. Clancy had experienced the growth, glory, and the obstacles of the credit union throughout its 39 years in business; but he knew the community charter opened up a new path for the future. He wanted to give the credit union its own identity, but didn’t want to forget its roots. So, he thought back to where the credit union started, and where he started – Lone Star Gas Company. The Board of Directors renamed the credit union to Lone Star Credit Union and Mr. Clancy ingrained the family oriented culture he experienced at Lone Star Gas Co. into the heart of LSCU. Jerry Clancy, LSCU President, reviews accounting data from 1970 in the old ledger. For Mr. Clancy, the most memorable part of his experience at Lone Star Credit union has been helping people in his community and having the chance the help their kids – and now grandkids. He recalls several Members who he recently connected with that brought his work full circle. One Member, Thelma, remembered a conversation she had with Mr. Clancy about a famous blues guitarist she was kin to. She brought him a keepsake with the guitarist’s original signature on it just a few weeks ago. Mr. Clancy first met Thelma when he helped her with a car loan in 1974. Another Member saw Mr. Clancy in the lobby at our Dallas office and introduced himself. He was a former Lone Star Gas employee’s son and recalled how much his Dad talked about Mr. Clancy. The Member told him that it is because of that connection his dad had with Mr. Clancy he was still a Member of LSCU today. Mr. Clancy plans to spend as much time as possible with his grandkids and is also traveling to visit his daughter, who lives in Europe, for a couple of months. When he returns, he says he’s considering working part time at a garden center or the Texas State Fair – his two favorite things other than his family.